At Schelstraete Dressage, competition-level dressage is a top priority. Jonna starts with young, talented dressage horses and trains them herselves. This means that the horses usually spend longer periods of time at our stables. Reflection, who competed in Prix St. Georges, has been with Jonna for several years and is recently sold to Belgium. Last August, Jonna and Alonzo, a seven year old black gelding, went to Verden for the WC for Young Dressage Horses where they ended 12th! Alonzo competed in the Fourth level and is now sold to America.Chicago M.H. Is growing very fast and is now in the middle of the selections for the WC for Young Dressage Horses in Verden. An important aspect in the training process involves the maintenance of good health and an eagerness to work, while continuing to maintain a focus on basic training skills. 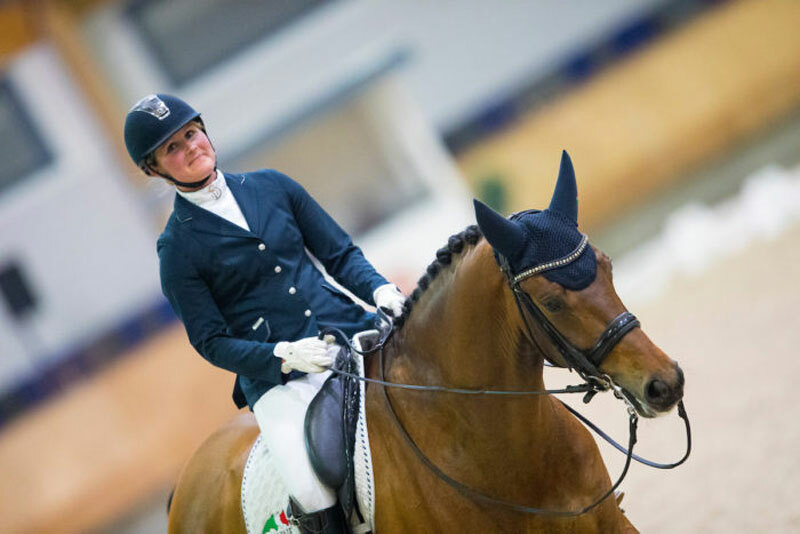 Jonna has trained by Nicole Werner, Jo Willems and Anky van Grunsven. All the horses are developing extremely well, and are scoring far above average at competitions. At Schelstraete Dressage stables, young, talented dressage horses may be offered for sale or purchase, training, and showing on the dressage competition circuit by owners/ breeders and at favourable prices and terms. We also offer private riding lessons on location to ambitious riders and horsewomen.